Northants wicketkeeper-batsman David Murphy has suffered a lower back injury which will see him miss a large chunk of the season. The 27-year-old has been forced to have surgery on the problem and will not be fit to feature for some time. Murphy has not made an appearance in either the County Championship or Royal London One-Day Cup this season. And he is now setting his sights on a rapid recovery as he bids to play some part in the latter stages of the campaign. “Despite putting a lot of work in over pres-eason, once the season started, things began to deteriorate slightly and I’ve just not been able to play,” Murphy said. “I had an operation last week to repair the disc, which went very well. My focus now is getting fit again. 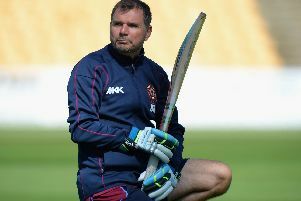 Northants head coach David Ripley added: “Murph has battled his back issue for some time and now surgery is necessary which is a great shame.